The millennium-old custom of binding Chinese women's feet 1 has all but totally faded into the past . Most people have only heard tales of this practice, as very few women with bound feet are still alive. Yet there still exists one well-known village where many women with bound feet live. 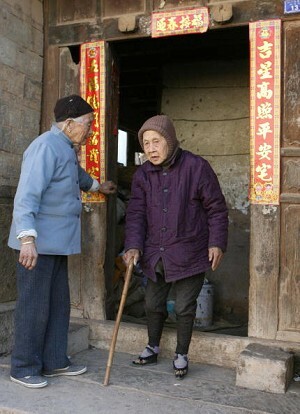 In Beijiao Village in Fujian Province, there are over 20 elderly women, most in their 80s, all having three-inch lotus feet. According to China's Shenzhen Press Group, Beijiao Village, an isolated coastal village located in Tailu Town, Fuzhou City, is the last village of women with bound feet in Fujian and in all of China. 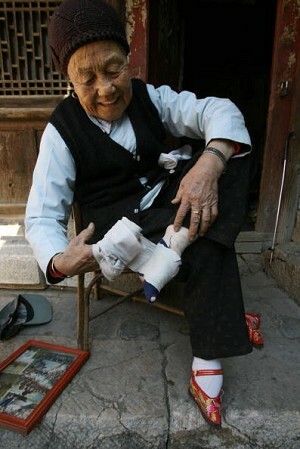 One of the women with three-inch lotus feet, 81-year-old Lin Fengfeng said in an interview on July 3, 2007 that she began binding her feet when she was five years old, in 1931. 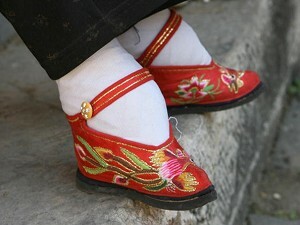 Although the custom had been phased out in most of China due to contact with the outside world, foot binding was still a popular practice in this isolated village during that period. Women still regarded a pair of tiny feet as a sign of feminine beauty. In Lin Fengfeng's girlhood, young girls often compared each other's feet to see whose feet would be tiniest and thus the most beautiful. The girl who had the tiniest feet would become the envy of all the others; this meant that as she grew up, there would be more women matchmakers proposing marriage alliances to her parents. Despite their twilight years, these bound-feet women are still just as concerned about their looks as when they were young. When meeting strangers, they dress up, do their makeup and hair, and put on their favorite shoes. Few of these women have ever left Tailu Town, except one who once went to Fuzhou to see a doctor. In fact, they are not interested in the outside world, and instead, they are content to live calm and peaceful lives with their families. The men in the village work hard at sea all year, exposed to the threats of regular typhoons and storms; usually they do not live as long as their wives. Therefore all of these bound-feet women are widows living with their children and grandchildren. For those who are still in good shape, they help out the family to the best of their ability by doing laundry, cooking and mending fishing nets, etc. When duties permit, they get together to chat or play cards. Note:  The practice of foot binding may have started during the rule of Li Yu (or Li Houzhu), the third and last emperor of the Southern Tang Dynasty (937–975 A.D.) It was initially banned in 1911.